I'm getting back into hobbyist electronics after a very long hiatus and was wondering what the current state of circuit simulation software is. What is the industry standard for macs or PCs? What are the open-source alternatives? LTspice is free and works well for switching power supply designs. I also use Paul Falstad's Circuit Sim for concepts. When it comes down to designing power supplies (which is pretty much the only thing I use circuit simulators for) I usually rely on application notes and already designed supplies. If they use LT parts, I might try and optimise the design. WEbench by National Semiconductor is quite good, but I wish it gave you more freedom. Well some programs I've had chance to work are Multisim and Proteus (form what I've seen, I'd put them in "industry standard" slot (disputed for Multisim), as even the cheapest versions seem to be very expensive). They are generally nice and come with large libraries of components. They are also point and click, so you just select item from the list of items and place it on the circuit board. They also come with virtual lab instruments such as multimeter, oscilloscope and so on, so you can see how each part of the circuit behaves. Another interesting thing in Multisim is that you can use for example input form computer's microphone and redirect it to the virtual circuit or connect speaker of the circuit to computer's speaker. They also come with some microcontrollers, but selection is very limited in Multisim (some PICs only, if I remember correctly, but I never used that feature much). Proteus is supposed to be better, but I haven't used it much. Both programs were very easy to use. One limitation I found in Multisim which I couldn't circumvent is that only 4 wires can connect to each joint, so sometimes circuits can look a bit messy. As for the free software, I haven't had good experiences in that field. I've tried to use gEDA, but it proved to be too complicated for me. There is also gnucap, but I haven't had any experience with it. There's also this list form Wikipedia that could be interesting. The industry standard is PCs with Windows and all the major simulation packages support it. No one that I know or have heard of in industry does any circuit simulation on Macs. Linux is more common than OS X.
I use the SPICE supplied with the Pulsonix PCB software I use. It's actually SIMetrix SPICE, and a free version is available here. It has a very good reputation. LTSpice is very popular, and is free. If you've got an iPad, iCircuit is pretty neat. Needs a few updates but it's obviously the way forward for this kind of thing. I use MacSpice with OSX. It is completely text (netlist) and command line-based, though it produces decent graphical output. I'm not a SPICE expert, but apparently this one is done well, whatever that means. LT Spice has been mentioned more than once, and I'll add that not only is it free and of high performance, but the user base is unusually active and helpful. Others such as TINA are out there, but you won't find the degree of help if you need to figure out how to stick handle around tricky modelling issues (eg. using tanh as an approximation for functions that are not differentiable). There are also printed books available, if the dead-tree format appeals to you. Both Verilog and VHDL were competing for the industry standard designation back then, and I suspect that they still are. I've tried Quite universal circuit simulator QUCS it is open source, multi platform and very easy to use. 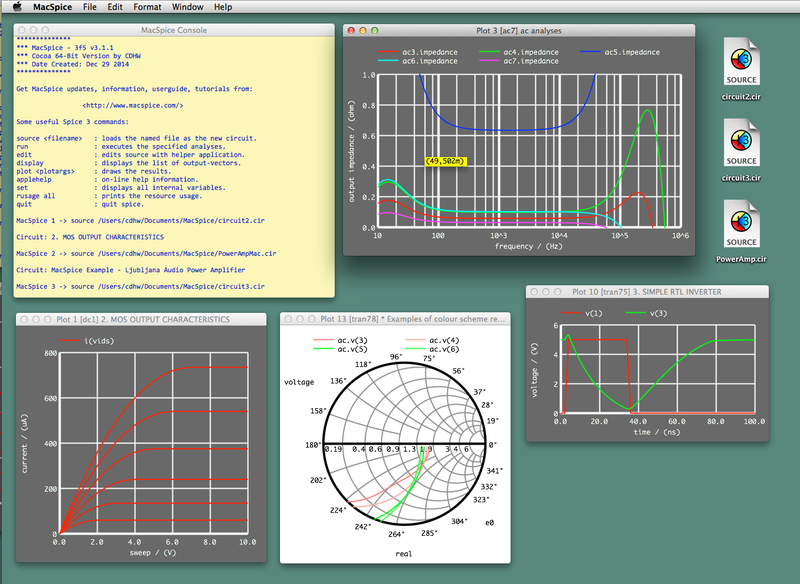 Analysis types include S-parameter (including noise), AC (including noise), DC, Transient Analysis, Harmonic Balance (not yet finished), Digital simulation (VHDL and Verilog-HDL) and Parameter sweeps. Should HDL languages be taught before software languages?